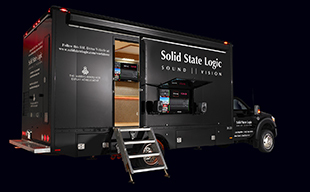 FRANKFURT, GERMANY  The Solid State Logic Duality SE continues to lead the industry with studios around the world celebrating its signature SuperAnalogue signal path and processing coupled with a refined DAW control interface. Dualitys success has been through enabling artists, engineers and producers to work quickly and ergonomically, and to consistently deliver superior sonic results for any style music or production. Available in a variety of frame sizes, Duality enjoys a diverse user base that includes many of the worlds most prestigious commercial recording facilities, on-air broadcast production studios, educational establishments, film and TV score specialists, as well as a growing group of notable private owners. Duality will be featured at Musikmesse 2011 (Hall 5.1, Stand B75). Tom Rowlands, of innovative and Grammy Award winning group The Chemical Brothers, is using a newly-installed 48-channel Solid State Logic Duality console as a creative tool for his private studio, Rowlands Audio Research. Duality provides the signal routing, channel count and DAW integration needed for new The Chemical Brothers projects covering writing, production and mixing. Duality also delivers the coveted SSL SuperAnalogue sound used by The Chemical Brothers on previous projects. Edizioni Ishtar has installed a 48-channel Duality Console in Studio A at its new Blue Spirit recording facility in Milan. The studio was built to support recording projects for release on Ishtars numerous record labels, which feature a wide range of music styles. Some of the artists represented by the label include Nicola Conte, Mario Biondi, Rosalia De Souza, The Dining Rooms and S-Tone Inc. Duality provides Ishtar with SSLs signature SuperAnalogue sound quality, feature set and DAW control to streamline production while delivering superior-sounding tracks across all musical disciplines. When Allan Pease, the noted author and lecturer with more than 25 million sales worldwide, looked to fulfill his lifelong dream of a return to composing music and performing, he chose a 48-channel Duality to be the audio centerpiece of his Heliport Studios. Nestled within 57 acres of rainforest overlooking the western Pacific Ocean, the studio features a wealth of outboard gear, vintage and modern microphones and acoustically engineered spaces, all of which are brought together by Duality. Well beyond a simple private studio, Heliport is bustling with a growing client list and will play host to a new pilot reality TV production that focuses on studio life. Ocean Trax Records, the parent company of Ocean Trax, Ocean Dark, Checkmate and Pauls Boutique record labels, has recently added a 48-channel, Duality in its newly rebuilt recording facility, House of Glass Studio. Housed in Regia A, the main studio control room, Duality provides the flexible power and sound of a signature high-end studio, with integral control of the resident Logic and Pro Tools® DAW systems. Sigma Sound Studios, the legendary Philadelphia powerhouse recording facility, has new management and, as part of a significant facility upgrade, has installed a 48-channel Duality SE and the innovative AWS 948 as the primary audio console/DAW controllers. The Duality room accommodates bands or orchestras of up to 24 musicians, but it is tied to a sound stage that is large enough for a 70-piece orchestra. Duality gives Sigma the capability to control resident DAW systems from the console surface, while providing superior SuperAnalogue sound quality, summing, signal path and processing. When the production facility, The Zoo, needed a console upgrade in Studio A, the clear choice for producer D1 was a 48-channel Duality SE. Acting as a creative collective, The Zoo community offers everything from top notch recording facilities to entertainment attorneys, managers, labels, video producers, artists, engineers and writers. The Duality is the audio centerpiece for the facility providing SSLs SuperAnalogue sound, VHD mic pres for tonal color, analogue signal path and integrated DAW control.